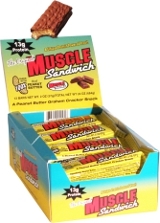 All the best Muscle Foods Muscle Sandwich deals in one place! Compare prices from all the top online stores to find the best price on Muscle Foods Muscle Sandwich. Fitness Deal News does the hard work for you of finding the best deals & coupons on everything fitness. 13g of Protein in Each Bar! Made with 100% Real Peanut Butter! The original Muscle Sandwich is a unique protein powered treat with a homemade peanut butter, graham cracker taste. Each bar contains 13 grams of quality protein and is a natural source of EFAs. Best of all, they are utterly delicious!